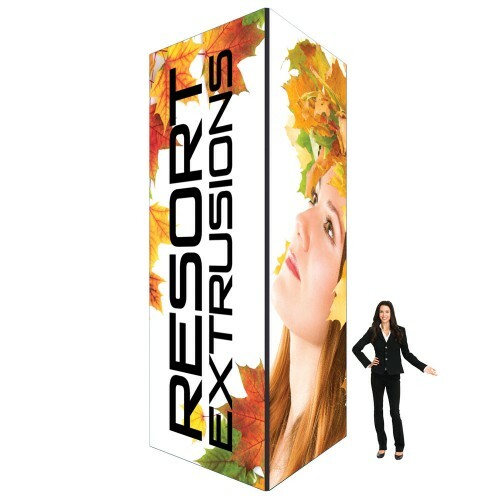 This 16ft Tall Portable Tower Display SEG Systems is super tall and extra wide. The 4 sided display allows your message to be promoted and seen from all angles and at greater distances on the convention floor. Exhibit booth towers are an excellent choice for island exhibit booths, set them up right in the center and have plenty of room all around the perimeter form counters, product shelf's and handout holders. You can store items insides by opening up a corner of the graphic the push fits back in place. With this tall size we suggest checking with your tradeshow venue to make sure this meets any height restrictions, we do offer shorter versions. About the Tower Graphics: The portable tower display is an SEG frame system that holds 4 large print fabric graphics for each of its 4 sides. The banners are custom printed with dye sublimation for photo quality prints with deep rich colors that POP. The Silicone-Edge Graphics (SEG) fabric graphic has a silicone edge beading that push fits into the frames recessed groove. This creates a taut smooth edge to edge graphic surface for branding and advertising. How to Setup the 16' tall Tower Display. Setting up your tower is fairly simple, more in depth instructions will come with your kit. First you will setup the tower frame. Start by laying out the extrusions, then build the 2 square sides of the frame using the torx key provided. Connect the two square frames together with the vertical bars to make the 4 sided cubicle frame. Tilt the frame down on its side to install the graphics into the recessed grooves. Start midway in the groove by pressing the straight edges of the graphic into the groove, then press in the remaining graphic in moving out towards the corners. Repeat for the other three sides. If setup is done correctly the graphic will fit snug and smooth. Carefully stand up the fabric frame by the edges and you are ready to exhibit.